The Pigeon Creek Shakespeare Company will present Cymbeline at the Dog Story Theater, August 11-20. 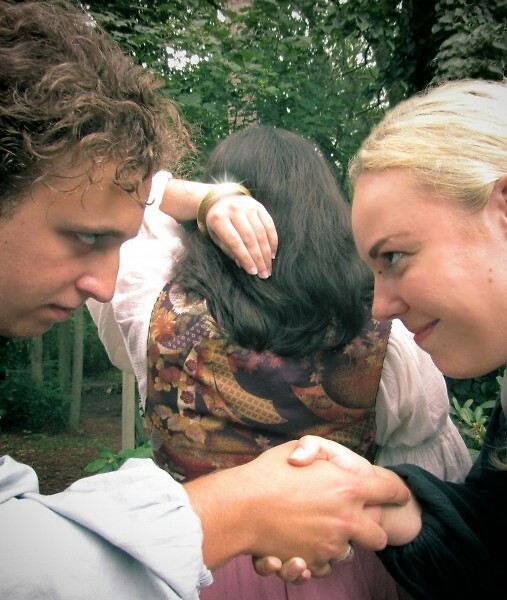 The Pigeon Creek Shakespeare Company will perform Shakespeare’s Cymbeline in Grand Rapids, Spring Lake, and Jenison on multiple dates from August 11 through September 9. The play, from late in Shakespeare’s writing career, follows Imogen, daughter of King Cymbeline, who is forced to run away from her father’s kingdom disguised as a boy. At the start of the play, Imogen has become betrothed to Posthumous against the will of her father and her step-mother. Posthumous is banished from the kingdom, and through the machinations of the conniving Iachimo, comes to believe that Imogen has been unfaithful to him. When Posthumous sends a servant to kill her in revenge, Imogen must flee in disguise as a boy. An evil queen, two long-lost princes, and the god Jupiter also make appearances. Set against a battle between the Roman army and King Cymbelines Britons, the play contains fairy-tale and magical elements typical of the end of Shakespeare's career, when he began writing plays that combined features of both comedy and tragedy. Pigeon Creek’s production is directed by Dennis Henry, a former actor at the American Shakespeare Center, who has previously directed Coriolanus, The Winter’s Tale, and Henry IV for Pigeon Creek. The cast features actors Kira Alsum, Alison Brito, Angela Boyle, Brooke Heintz, Kat Hermes, Noah King-Bates, Scott Lange, Amber Miller, Eric Orive, Tommy Ryan, Sarah Stark, and Jessi Towell. Many of the cast are making their debuts with the company. The Grand Rapids performances of the play will take place at the Dog Story Theater, located at 7 Jefferson SE, on August 11, 12, 18, and 19 at 8:00 p.m., and August 13 and 20 at 3:00 p.m. Tickets are $14 for adults and $8 for students and seniors. Tickets are available at the Dog Story Theater website, www.dogstorytheater.com. For information about other venues and more upcoming events in Pigeon Creek's 2017 season, please visit www.pcshakespeare.com.